The Unlikely Boat Builder: Learn the Rules Before Playing the Game! Learn the Rules Before Playing the Game! I always say I don't know how to do something until I'm done. This is because of a technique that I learned writing software. In the olden days (say, the 1980s) software 'engineers', as we were called back then, would study a problem exhaustively, devise a strategy to solve it, create a rigid 'waterfall' project plan, and 'engineer' a program. This engineering approach to software development failed miserably. Turns out, building software isn't like building a bridge. It's more like writing music. You start out with an idea and plink out a few notes on the piano. If you like them, you keep them. If not, you plink out a few more and keep going until you have a whole song. In other words, you start writing the song without really knowing where you are going or how you are going to get there. You confidently proceed as though you know the song will turn out in the end and somehow, magically, it does! At least most of the time. In the software world, that's called the 'Agile' method, and that's how software's been written for the last 10 years or so. From long habit, I used the agile method when I built Cabin Boy. As anyone who's read my Cabin Boy blog can attest, I had no idea what I was doing when I started. I just confidently proceeded as though everything would turn out in the end, and it did! It even worked when lofting Cabin Boy, even though I gradually came to understand that I had done a really lousy job lofting Cabin Boy's plans. This confident, proceed-as-though-you-know-what-you-are-doing approach doesn't work for everything, though. For example, if you wanted to win a chess game from an even mediocre player, it would be a really bad idea to sit down at the board without knowing the rules, first. You couldn't just say to yourself, "well, I know how to move the pawns, so I'll just move all of those while learning how to move the rest of the pieces." By the time you moved half your pawns and learned how to move your knights, the game would be over. You'd have to start a new game from the beginning and try again. The agile approach doesn't work for lofting a round bottom boat, either. I know, because I tried. I read a bit in my boat building books (BBBs), but after reading a few paragraphs, I had no idea what they were saying, so I figured, "Well, I know enough to get started. I'll learn by doing and it will all work out, somehow!" I laid down a few lines (which took hours), but soon reached the end of my knowledge. No problem! I just picked up the BBBs again to see what the next step was. Whoops! Turns out those lines weren't quite right because of something new I learned. So I erased them, re-drew them with my new knowledge, and got a bit further before -- hours later -- I had to stop and pick up the books again. Oh, heck! Turns out those lines were completely wrong! To make a long story short, it wasn't working. Well, it was, but it would have taken all year, plus a dozen erasers and pencils to finish. Plus my lofting board was only 3/4" thick. It would be thinner than the iPad2 by the time I finished with it. So I stopped, put down my drawing tools, commandeered the dining room table for a week, and figured out how to loft. In other words, I learned all the rules before starting the game. And that's the lesson for today: don't even think about trying to loft a round bottom boat -- even a very small one -- without knowing all the rules, first. Learn-by-doing doesn't work for lofting. Learn-by-studying does! But I didn't say it was easy! Easier said than done, because all of the BBBs -- without exception -- do a really bad job at explaining lofting. It's all there, especially in my 'Bible', Greg Rossel's "Building Small Boats", but it's rough going. I wonder how many people today actually know how to loft a round-bottom boat from traditonal plans, like those of William Atkin? Let's find out. There are about 1500 people reading this blog on a regular basis. Please rate your own lofting skills. Don't be afraid to say 'No clue!' No one will know it's you. "In the olden days (say, the 1980s) software 'engineers', as we were called back then". I got sucked into the programming world in 1965. I had given up as ever being able to survive making a living as an accountant and all my buddies were saying come on over to IBM. I didn't want to work in a big factory, but wife and 2 kids dictated a move. They sat me down to take an aptitude test for programming. I guess I did OK as they sent me to school and then gave me a job writing application programs. I was loving it for the first year. The rules were pretty simple - a flow chart and turn it into whatever code you were writing in. I wrote in Autocoder, COBOL, and Fortran for a 1401. My program was the only one in the computer which was about the size of half a room. Input was a card deck, and there was no such thing as random access storage. In those days we were called programmers and programming was still looked at as an art. Soon IBM decided that programming should be a science(I guess that equates to engineering) and took all the fun out of the job. Pretty funny, eh? Hope I didn't bore your other fans too much. A week is enough to dip your toe into the lofting waters. You gotta do it to understand it, and even then, there will be a fair amount of consultation involved. I like the Gougeon's blue book on lofting, but have used Alan Vaitses and the Mystic books on lofting in addition to Rossel's books. We could put together a list of books the cover lofting...might be instructive. Pete: It would be. I also found several books on Google Books... these are very old books from early 1900s. They look comprehensive, but they assume even more knowledge than modern BBBs do. I'm going to see if I can write up a simple how-to when I'm done. Ha! Of course, knowing the rules of chess doesn't make you a good player, but trying to play without knowing the rules is inefficient, at best. Ralph: You were a bit a head of me. I went to RPI for EE, originally, in 1971, and they made me take a Fortran course on a IBM 360, with punch cards. Hated it! It wasn't until micro computers came along and seduced me away from useful work that I got into computers. Ah well. I still get excited about computers, I must say... I'm very tempted to learn how to program my iPad, just for fun, but Helena says NO! She doesn't think programming is healthy. The Gougeon Brothers on Boat Construction (5th edition - blue cover). (can't find my copy to give you the ISBN, but this is the current edition...make sure you use the blue covered book). Hope this helps. Don't consider myself an expert, but would be happy to contribute to your effort if you pursue it. Great googley-moogley, do NOT compare boatbuilding to writing software. A boat has to work without beta testing by the customer, and without the customer being billed for debugging, and if a boat suddenly sinks due to a design glitch, very few customers will come back and buy the next boat the builder designs that has fixed that glitch!Also, in boatbuilding, elegance of execution is everything. Nobody ever notices code workarounds, but everyone notices unfair lines and bad fillets and scarphs. Two thumbs up on 'Cabin Boy"! Looking forward to the next build, and the next series of hilarious faux pas. As I read them I keep repeating "better him than me"as I had planned on building a wooden boat - and still will if YOU are ultimately able to maintain some semblance of sanity. A year ago, in preparation, I read Chappelle's BBB and wound up babbling incoherently for weeks. Learning a new language will do that to some people. I decided to start with French, which has endeared me to my 'beautiful woman' as she can at least converse with me. however, I am planning to move quickly to Sandskrit, and thence to Boatbuilding terms by which time she will have gone back to her cello. Looking forward to seeing Vintage take shape. Barry: well , you can see the pile of BBBs I have. I'd say Chappelle is one of the hardest to read. The easiest for me to grasp is Greg Roselle's book. But at the end of the day, the only real way to learn is by doing. At some point, you need to stop reading and start making sawdust. My main purpose in this blog, and in exposing all my mistakes, is to say, hey, if I can do it anyone can! As someone said, getting out the front door is half the journey. I came upon your blog Sunday 4/27/14 and could not stop reading! I hope you continue to write and post,build and sail. Hello John, I know that I am quite late to the party, however back in 1985, I too had the dream and desire to build my own traditionally crafted boat. I had purchased a 23 ft Alberg designed Sea Sprite that was made in 1957 out of fiberglass and had this crazy notion the if I could find a copy of lines with offsets that this would be "my" wooden boat. After reading everything I could and still not quite getting the lofting thing right in my head, I happened on a three day class at Mystic Seaport with John Gardener on wooden boat building. And salvation of salvations lofting was part of the course!!! I took the course and learned so much more than lofting from John that I felt I could indeed build my own boat. Well as you know, life has a way of getting in the way of our plans and dreams, and now the closest I have been able to come to realizing my dream is reading blogs like yours. 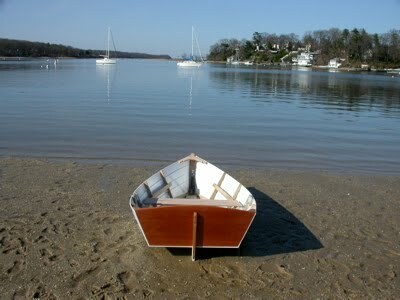 If nothing else you have helped keep my dream alive once more of building my own traditional wooden boat. I hear you. I’d still like to build another boat, but I have my hands full taking care of my 49’ ketch now. There isn’t time for everything, alas!